Discussion in 'Australia' started by motormail, Jan 2, 2011. Couldn't find an Australian thread just for the XT's so figured I'd start one. Here's a link to my 1991 XT600E thread. Here is my old girl. Great old bikes. Mine is an MP XT 600. Very strong motor and the brakes on this old girl are great. Great way of getting into Adventure riding on a budget. You can load these old girls up and away you go. Easy to work on and hardly give ya any probs. Good size tank on them as well.. This is a pic of when I first got her home before I replaced everything that needed doing and yeah, removing all that old grease that the Army puts into them..
And another, racks were off for painting and everything else done including some decent rubber.. Recent major service including re-bore, 1st over, piston and rings, valve guides, new clutch, fork seals, fluids. Have a Yoshi muffler to fit soon. Progressive fork springs and a respoke for the front wheel at next service (500 km run in). That's an awesome looking Xt you've got there. Can you tell me where you got the black plastics from? Anyone know what model XT fits what in the way of plastics? Just had a thought, does anyone know how to load a document into ADVRider, a blog or website which all XT owners can share specific info on a single document eg. websites to get stuff for each sort of XT and or eg. what footpegs from other bikes fits onto a 1991 XT600E? Answer = Yamaha TW200. I think this sort of document would be beneficial to all XT owners instead of having to troll through hundreds of pages of ADVRider, HorisonsUnlimited, etc to find the info you're after. I think the 94 model had black plastics - one i got second hand, and the other was a genuine part i got from the local yamaha dealer. - taco drive - 90-95 has a blanking plate, whereas 96-02 has a drive. these should be interchangeable. i forgot what it looked like..... wow thats a nice ride!!! Thanks - I'm pretty happy with how the XT is now, though it has taken some time and of course there's always something else to do. I'll be putting an army rack i got from Mike on the rear soon purely for practical purposes. I'm aiming to do some more work on the front brakes, including a (knock off brembo) radial master cylinder. Down the track maybe some sort of four piston front caliper and the associated relocating bracket ("the hard part"). I'd also like to try out some Ninja 250 CVK carbs or flatslides and a higher compression piston - My SRX6 has an 11:1 piston and keihin FCR33's and it goes like stink. We'll have to have a Brisbane catch up sometime - between you, mike, danjet, luke and mezo we've got quite a few XTs. 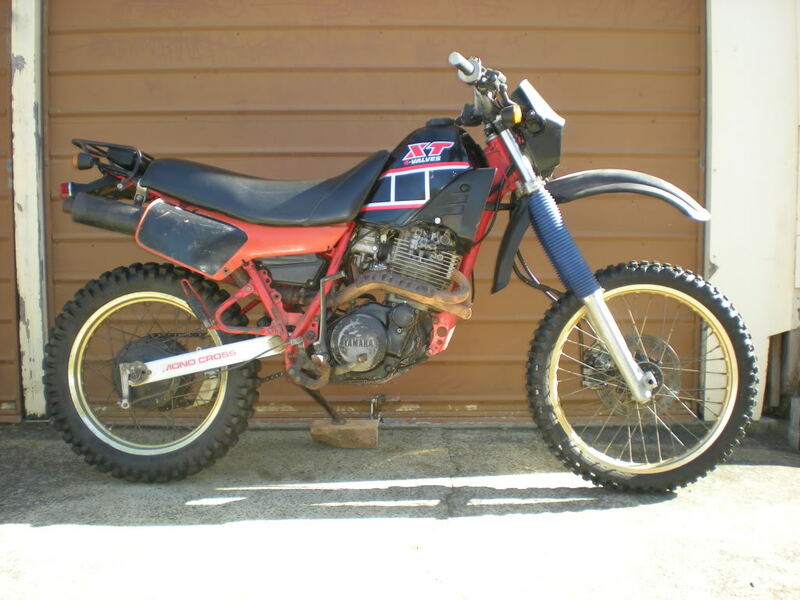 I have a 98 TTR600 Belgarda, very different to an XT i know but apparently nearly identical engines? BTW, roughly how many trouble free k's are these engines capable of ? Sure, why not - wish i had a TT since they're a bit spec'ier than the XT's! Provided they get regular oil changes, the electric start XT's (90-2003) will easily do 100k kms before any work to the top end is required. not sure on the life of the bottom end, but i'm guessing 150k at the very least. TT's would surely be the same, since i understand that the only difference is cam and jetting. even if they had a slightly higher comp piston i can't see this making too much of a difference. Lets hope we get a few more XT/TT owners in here to share some knowledge..
An 08 XT660R... Some may say ..bland.. And some may need to go for a ride. Its very different to my other bike but in its own place i'm starting to get to like it. Still running it in and learning that its going to teach me a few more lessons and serve up lots of fun. Yep I think the whole XT thing is prity cool. They hav ebeen making these things since year dot and they seem to hit a spot prity well heynev. I spotted one old unit stuffed in the corner of a shed a few years back and thought not much more of it until a couple of weeks back when it was going down the road in all its choockshit and rags covered glory....and it sounded ok.
Had mine out again this a/noon to go up and feed the dogs on another place. It gets better with every ride. ps Nev ,Victorias not that big mate, your outfit would bust out of the place in a day. I am just about to embark on round 2 of the refurb of mine. Does anyone have a wiring harness or know where i can get one ?